“Diamonds Are Forever” according to the title song of a James Bond movie, but your appreciation for a job well done should also last forever. Our Diamond Crystal Trophy makes the ultimate timeless gift. An azure crystal base supports a 3/4” thick diamond shaped award. The flat front face provides an elegant engraving plate, which will hold up to six lines of text. Our artists can also use our laser engravers to etch graphics such as company logos or other artwork. All engraving is free of charge. Two sizes are offered in this gem of a tribute: CRY505S measures 5" x 8" and weighs 4 pounds while CRY505L stands 6" x 10" and weighs 5.5 pounds. This priceless prize comes in a deluxe satin lined gift box ready for presentation to that retiring employee, successful CEO, or hardworking volunteer. 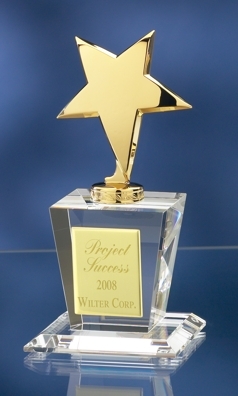 Order a Diamond Crystal Trophy today!